Recently, there was a popular Meta question concerning changing the site subtitle to prevent inbound migrations of off-topic questions. We continue to receive off-topic questions that are asked directly at ServerFault. When asking a new question, users are told only that their question should relate to "servers, networking, or desktop infrastructure." For the majority of users who do not read the FAQ, there is no indication whatsoever that questions will be rejected if they do not relate to these topics in a professional capacity. We are wasting our time, not to mention that of countless naive askers, because the "Ask Question" user experience practically invites off-topic questions relating to home networking and home workstations. 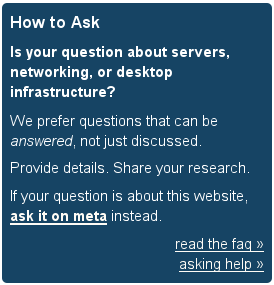 Should we change the "Ask a question" title hint and sidebar to specify "in a professional capacity"? Is your question in a professional context, and relating to servers, networking, or related infrastructure? The drop of 'desktop' is intentional as a minority of such questions that get asked here are actually topical. It is by far the most subtle thing in our scope to explain, and one that just can't be done in 15 words or less; especially 15 words that have to explain other topics as well. Not the answer you're looking for? Browse other questions tagged feature-request status-completed asking-questions .